Simon Holloway has sent several photos from the lives of Wilfred and Evelyn Chapple of Walnut Tree Road, Brentford. 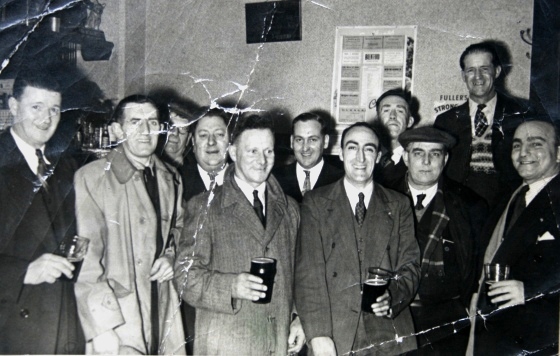 This photo was taken at a Union meeting around 1950 in a Barnes or Putney pub. Wilfred Chapple is second from the right, he worked as a steam crane driver for Clements Knowling on the docks. There is a Fullers advert in the background and the pinboard on the same wall has the word 'Brentford' centre top.